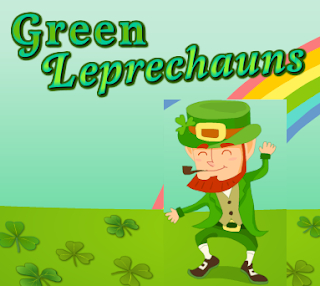 Green Leprechauns is different presentation of Akari or Light up game. In this game your aim is to place leprechauns onto the grid so as to turn the whole area green. At the start of the game you will be given a 10x10 grid which contains a number of shamrocks. Some of the shamrocks are marked with numbers, which indicate the quantities of leprechauns in the horizontally or vertically adjacent blocks. If a shamrock is not marked with a number, you can put any number of leprechauns beside it. A leprechaun can turn all the blocks that he can see green, but note that he cannot see through a block which contains a shamrock, and the leprechauns should not be seeing each other. Click an empty block to place a leprechaun, and the blocks that the leprechaun can see will all be turned into green color.